September is Ovarian Cancer Awareness Month, but many people still aren’t aware of the symptoms and risk factors that can sometimes lead to an ovarian cancer diagnosis. It is even called the “silent killer” because symptoms are often attributed to other ailments. You may have heard of “breast self-awareness,” a term that replaced the “breast self-exam” to more properly describe the importance of knowing your body, specifically the normal look and feel of your breasts, in order to monitor your breast health. This September, in honor of National Ovarian Cancer Awareness Month, Bright Pink, a national nonprofit focused on the prevention and early detection of breast and ovarian cancer, is encouraging women to adapt a new term and take an active role in their health by practicing ovarian self-awareness. 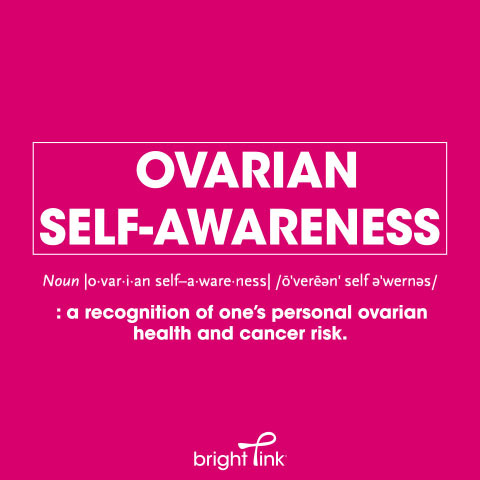 A term coined by Bright Pink, "ovarian self-awareness" is defined as a recognition of one’s own ovarian health and cancer risk. Here are two steps you can take to personalize your approach to ovarian health management by being #OvarianSelfAware. What type of cancer did they have? What age were they when they were diagnosed? Ovarian cancer has genetic links to other forms of cancer (especially breast cancer) so it’s important to get as comprehensive of an understanding of your family’s history as possible based on what information is available. Bright Pink is a national nonprofit focused on the prevention and early detection of breast and ovarian cancer. Together with Color, Bright Pink is empowering women to know their ovarian cancer risk and how to manage their ovarian health proactively. Visit BrightPink.org/OvarianSelfAware for additional resources that will help you take a proactive, personalized approach to ovarian health management. Be #OvarianSelfAware today. And, if you’re curious to learn more about how your genetics may play a larger role in your cancer risk, take advantage of $25 off Color’s Hereditary Cancer Test in Honor of Ovarian Cancer Awareness Month. Use the promo code BRIGHTPINK at checkout through the end of September.